and get out of town for good. Easy doesn’t fit in – a half-Black girl in this Canadian prairie city, raised on zydeco music and working in her dad’s garage. Then Janis Joplin‘s tour train stops nearby, and Easy’s future path becomes clear… to a certain extent of uncertainty. Questions, secrets, and such a 1970 roadtrip! How far have you gone to see someone perform? Book info: Freedom’s Just Another Word / Caroline Stellings. Second Story Press, 2016. [author interview] [publisher site] Review copy and cover image courtesy of the publisher. My Book Talk: Easy absolutely must find a way to get from Saskatoon to Texas so she can sing with Janis Joplin! The Canadian prairie is as far from the segregated South as her black parents could get after the war, then a scandalous affair produced biracial Louisiana who’s done with high school and past ready to get out of town. Between 1970 concerts, Janis Joplin’s train will stop here, and Easy is determined to sing the blues for her idol. Through her drunken haze, Joplin recognizes Easy’s talent and invites her to Texas so they can sing together! A road trip with two nuns, a stopover on Route 66, secrets whispered, secrets unleashed. If only her Pop would work in his garden again or dance with her in the living room like he used to! A parent’s illness is lots to handle for kids and teens, Trudy included. This is the first book by Jessica Lee Anderson who later wrote Border Crossing (my recommendation here) and Calli (recommended here). How have you dealt with family changes and school changes at the same time? Book info: Trudy / Jessica Lee Anderson. Milkweed Editions, 2005. [author site] [publisher site] Review copy and cover image courtesy of the publisher. My book talk: Lockers, changing classes, tests with not-so-good grades – middle school isn’t fun for Trudy, especially when her elderly father starts acting odd and best friend Ashley gets popular. Born when Ma was 53, Trudy now has to correct people who think her grandparents are raising her in their small Austin home. Math is easier when Roshanda explains it, and the sixth graders quickly become friends – so great to laugh together! Pop is just digging in his garden now, not planting, and he’s tired all the time – so strange. Jerome is really cute, and being partnered for a class project will be perfect for Trudy, right? Canned goods in the bathroom, calling their car a train…it’s Alzheimer’s, says the doctor – what will Pops do next? This fall semester is more eventful than Trudy ever dreamed. is her family more than human? Unlike her stepsister, daredevil Julia isn’t perfect, hangs out with the not-perfect boy ‘cousins’ and is exiled to public school for letting outsiders see their superhuman strength. Pretending to be less-strong, less-smart, less-amazing is second nature – but what if she wants to be herself with John? Look for this first book in The Select series at your local library or independent bookstore, as well as just-released book 2, Select Few. Book info: Select (Select, book 1) / Marit Weisenberg. Charlesbridge Teen, 2017 [author Facebook] [publisher site] [author video] Review copy and cover image courtesy of the publisher. My book talk: Sent to public school as punishment, Julia discovers that her ‘family talents’ hide a deep secret that the Austin teen may not want to be part of, but does she have a choice? Her descent from elite untouchable was abrupt after the dumb dare that got Julia and the guys she’s known forever noticed by the police, but is being ignored at a new school (and having to fake being merely outstanding at tennis) any worse than being scorned by her family group? They heal overnight, run faster and farther than anyone else, sense trends before everyone else – but are those the only talents shared by her extended family? When she starts sensing John’s thoughts at school, Julia becomes convinced that her charismatic father has been hiding much from the younger family members – but why? As their feelings grow, Julia knows that she must protect John and his family from hers – but is it too late? College will be better than high school, of course. Learning fiction writing from an amazing author! Connecting with Sam is…um …just text, okay? Her mom still acts and dresses like a teen, her new roommate Jude is vibrantly alive, so Penny is grateful for the quiet text life she has with Sam (who is 21, but somehow Jude’s former step-uncle). But can the Korean-American teen become brave enough to write like she should, go out with Jude and Mallory, actually visit Sam in person at the coffeehouse? And P is also for “plans busted to smithereens” as this debut novel told in alternating chapters by Penny and Sam (lots of texts) moved onto the New York Times Bestsellers list last week before our A-to-Z got to P!! Yes, Mary will be at the North Texas Teen Book Festival on Saturday, 20 April 2018, and you should be there, too! Real life or by text? Book info: Emergency Contact / Mary H.K. Choi. Simon Schuster Books for Young Readers, 2018. [author site] [publisher site] Review copy and cover image courtesy of the publisher. Yeah, Stevie is homeschooled (don’t hold it against her), but new guy Max next door has all her co-op pals beat for weird (more than the usual “Keep Austin Weird” bumper sticker kind of weird). Should she and best friend Sanger spend their Austin summer helping Max live out his “23 ways to fake my death without dying” list so that he can get over his near-death experience? And is she seriously falling for Max? Austin. Summer. Weird. Love. Funny = definitely! Book info: Lucky Few / Kathryn Ormsbee. Simon Schuster Books for Young Readers, 2016 hardback, 2017 paperback. [author site] [publisher site] Review copy and cover image courtesy of the publisher. Ask for this powerful #ownvoices story at your local library or independent bookstore as Abram thinks lyrically of his embattled present while trying to avoid remembering his family’s past or dreaming too much about a future beyond it. Can we fight destiny, our DNA, our desires? Book info: Bloodline / Joe Jimenez. Pinata Books/Arte Publico Press, 2016. [author site] [publisher site] Review copy and cover image courtesy of the publisher. My book talk: Calls to fight ring louder than any teacher’s voice, as 17-year-old Abram struggles to be worthy of Ophelia’s love, to live beyond his family history, to make it past junior year. “Not all boys need fathers. Better to have no man around than to have a bad one, don’t you think?” says Becky (p.2)- so why did his grandmother invite Uncle Claudio, her son with the long police record, back into their lives again, despite her girlfriend’s advice? “Be a man!” – what does that mean in their worn-down San Antonio neighborhood? In the dank boxing gym with Uncle? In the world? “Blood is thicker…” – will Ophelia know if Afghanistan swallows her deployed mother? Is Abram doomed by his parents’ DNA? Abram forcibly remains in the present moment, as his past brings overwhelming fears and the future beyond tomorrow is too hazy to see, as the cold November rains pelt down and days grow shorter, so much shorter. Adrian cannot escape reality with video games and his graphic novel art any longer! He must stand up to Doug and the other thugs whose gay-bashing has gone from talk to violence or he won’t be able to live with himself…if he survives their wrath, that is. Visit the book’s website here to meet all the characters who’ve moved from Adrian’s real world into the graphic novel that he’d rather live in. The paperback of Draw the Line releases in May 2017, but grab it now to see how this epic superhero battle on paper turns out in real life. Standing up for what’s right – who’s next? Book info: Draw the Line / Laurent Linn; illustrations by Laurent Linn. Margaret K McElderry Books, 2016. [book website] [author site] [publisher site] [book trailer] Review copy and cover image courtesy of the publisher. My book talk: Adrian escapes from his homophobic rural Texas high school by creating the detailed Renaissance world of gay superhero Graphite in graphic novel art, until violence demands action. He finally has a date with super-sweet Lev (‘Teen Drag Queen Bingo’ in Dallas – who knew? ), when a hate crime shocks their town, and Adrian knows that he must finally speak out and come out – at home and at school – regardless of the consequences. Can the support of best friends Audrey and Trent keep him strong? How can the school and town turn a blind eye to Doug’s attacks? When will Adrian being himself be good enough for everyone else? Chapters of his graphic novel with Graphite, Sultry, Willow, Oasis, and villainous Thug punctuate this story of becoming true to yourself and standing up for everyone’s rights. Pageant fees week after week, check. Hair falls for a seven year old, check. Reality check for Mom… nope. Oh, yes, Lexi realistically could be tagging along after her little sister to beauty pageants every weekend of the year – thank goodness for her supportive friends, especially when her mom’s obsession with Mackenzie’s pageant appearances gets out of hand. Check out this video interview to find out where the title came from (she told this story at TLA2014, too), then find this 2013 release in hardback or paperback now at your own local library or favorite independent bookstore. Where’s the line between looking good and living for your looks? 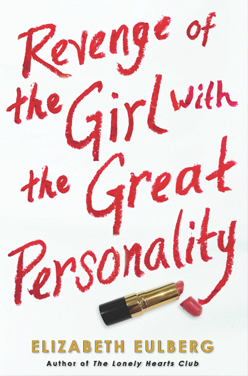 Book info: Revenge of the Girl With the Great Personality / Elizabeth Eulberg. Point, 2013. [author site] [publisher site] Review copy and cover image courtesy of the publisher. 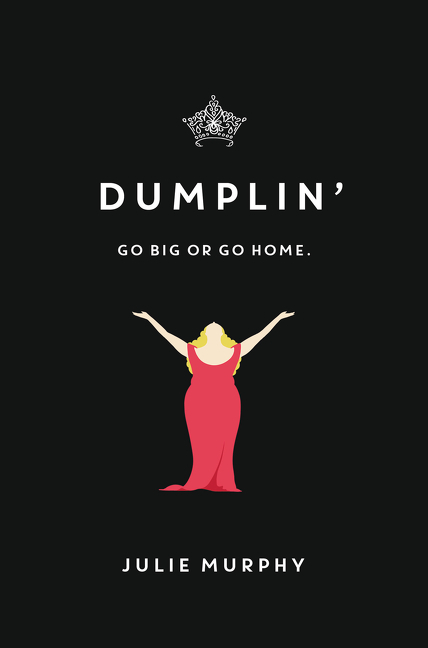 My book talk: Her little sister is a Texas beauty pageant princess, so if 16-year-old Lexi wants more from life, she’ll have to overcome the “great personality” label and make her own way (despite their mom). Downsized into a doublewide trailer because child support won’t cover house rent and Mackenzie’s pageant costs, Lexi feels unappreciated as she saves up for the fashion internship in New York City. Cam thinks Lexi’s crush on Logan (boyfriend of beauty queen Alyssa) is ridiculous, Benny challenges her to a makeover in teeny steps, and she dares him to let cute guy Chris know his feelings. Will she really stop hiding behind baggy clothes and messy hair? Will Lexi and Benny ever escape their judgmental small town? Will these pageants never ever end?